Tens of thousands of Jews once lived in Libya; now there are none left. The numbers are equally as astonishing throughout the Middle East, but they are rarely brought to light. 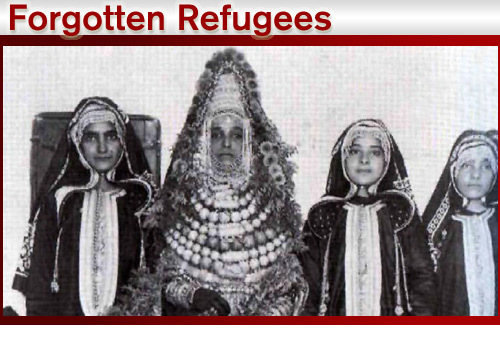 Using survivor testimony, The Forgotten Refugees tells the neglected story of Jews who were forced to flee their Middle Eastern homes when their governments made being Jewish a criminal offense, and neighbors threatened their lives. The Forgotten Refugees gives voice to the thousands of Jews who, up until now, have quietly carried the memory of their destroyed homes. Their stories expose the deep roots of anti-Semitism in the Middle East, reflecting just how complicated the conflict is, and the great challenges Israel faces in trying to reach a peaceful co-existence with its Arab neighbors. Centuries of oppression can’t be easily overcome, and, according to the film, anti-Semitism in the Middle East is only getting worse. Starting in the seventh century, Muslim leaders in the Middle East recognized their nations’ Jewish minorities as dhimmis, or second class citizens with fewer rights than the Muslim majority. Under this system, Jews weren’t even allowed to ride horses because it would make them taller than Muslims. But the persecution Jews faced came to a head in the twentieth century around the time that Haj Amin al Husseini, the Palestinian nationalist who had close ties to Hitler, declared, “Arabs, raise as one man and fight for your sacred rights. Kill the Jews wherever you find them.” Anti-Semitism escalated and manifested itself in anti-Jewish regulations similar to the Nazis’ Nuremberg laws, violent riots, and, in some nations, massacres and expulsion of Jews. The only thing that makes the horrific stories more awful is the way in which the global community reacted, or failed to react. In the documentary’s view, no one has been willing to recognize the injustice that Middle Eastern Jews have suffered. Since its formation, the United Nations has passed 101 resolutions regarding refugees in the Israeli-Palestinian conflict, and not one of those resolutions dealt with Jewish refugees. According to The Forgotten Refugees, the abuse of Jews in the Middle East proves the necessity of the state of Israel; and after hearing refugees’ stories, it seems overly simplistic to understand Israelis as the persecutors and Palestinians as victims. The fact is, thousands of Jews escaped to Israel after being thrown out of their original homelands, where they faced constant fear and oppression. One woman remembers that even little children were full of violent anti-Semitism–they would throw stones at her when she walked down the street and yell, “You’re a Jew! You’re a traitor!” For her and other refugees, Israel was the only nation in the Middle East that promised safety. Reconciling the two competing loyalties and identities within her proves as challenging as brokering peace between the two nations.